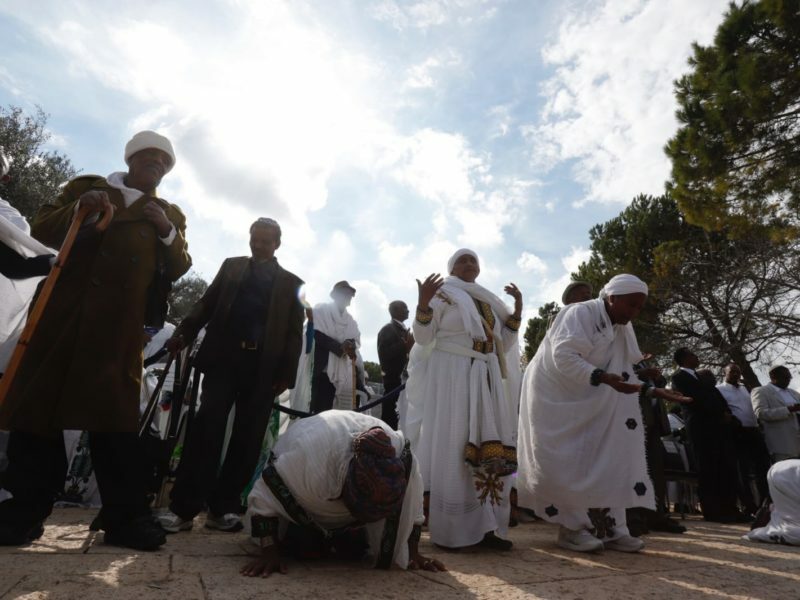 The haunting prayers echoed loudly throughout the Jerusalem hills as Ethiopian Jews from across the country gathered on the Sherover Promenade in Armon HaNatziv in the capital to take part in the Sigd high holy day. Raanan, an Ethiopian Jew who walked to Israel in 1984 through Sudan as young boy, explained to Tazpit Press Service that the holiday takes place exactly 50 days after Yom Kippur (the Day of Atonement). “The word Sigd in our ancient language Ge’ez – which is our version of Yiddish or Ladino – means to bow or prostrate oneself. It connects to the Aramaic word Sged, which means bowing for prayer. “It’s almost like another Yom Kippur. We fast for the entire day, we dress in white, we pray and we introspect about ourselves and our actions. It’s a day of repentance so that we can know we are worthy to return to Zion, to Israel and to God,” he said. According to Ethiopian tradition, Ranaan said, it’s believed this is also the day God revealed himself to Moses. At the end of the day, Ethiopians have a large celebration and feast, with music and dancing, he said. In Ethiopia, Raanan said he remembered going up a mountain in Gondor as a young boy of six or seven. “It was really exciting and emotional. It’s done every Sigd. We go up the mountain as a symbol of how Moses and the Jews went up to Mount Sinai and received the Torah. The women and elderly usually stay behind. “Once we would come down, then the celebrations and feasting would begin,” he said. Many of those attending the prayers were dressed in white, some bowing and some with their hands in the air as certain prayer segments were recited by Ethiopian religious leaders. The prayers were heart wrenching and although most of it was said in Ge’ez, the words still deeply resonated through all who were in attendance. Some of the woman were crying, an one woman, while wiping her eyes, told TPS that she was pregnant, and she was crying out to God to decree that her child to be a good and righteous Jew. Several schools from around Israel also brought students to learn about the holiday as many local Israelis are not aware of Ethiopian Jewry culture and customs. Daniella, a student from a high school in Jerusalem said that she had learned about all the operations to bring Ethiopians to Israel, but had never really gotten to learn about or understand Ethiopian Jewish culture. Friends and relatives who had not seen each other in some time hugged and kissed on the cheeks, and others who were meeting for the first time were exchanging their stories of struggle and unity. Information tents were also scattered around the promenade where people could learn more about the holiday, and children – Ethiopian and Israeli – could draw and read books about the holiday. Ethiopian immigrant, Sarit who came from Ramle, said that she came to Israel in Operation Shlomo in 1991. “It was very hard for me to integrate. It [Hebrew] was a new language and I didn’t understand anything – sometimes I wondered if I was being cursed at or what people were saying to me. “Because of this, I chose to work with new immigrants coming to Israel. I know and understand how hard it can be,” she added. Asked about the meaning of Sigd to her, Sarit said that as a young child she remembers crying that she couldn’t go up the mountain with the men during Sigd. “We would all wait and wait, and as they came down the mountain there was a beautiful party with special bread, delicious dishes and music,” she recalled. “Today I am so grateful to be in Israel, to be in Zion – something we would dream and talk about when we were children. That’s what this holiday is all about to me. Commemorating and thanking God for bringing us and delivering us to Israel,” Sarit added. Yaffa, who traveled all the way from Netanya said there were nine buses filled with people from there who had come to take part in Sigd. “It was a very long road to get to Israel for me and my family. That is why I am here, on this mountain in Zion, and that is why I come every year. “I was 12 years old when I walked with my family from Gondar, Ethiopia to Israel. For most of the journey, I did not have real shoes. I had blisters and water and food were scarce. Many people I knew, who joined us in our journey, died. “That is the hardest part for me – so many people didn’t get to take part in the joy of being here and returning to our home, it’s sad but I am grateful and blessed that I made it with my family,” she added, saying how proud she is to be a part of the Jewish people.